The Poweshiek County Dental Coalition, along with area dental offices, work together to bring dental treatment to children throughout the county. Yearly, they open their doors to provide free dental care. This year’s annual Give Kids a Smile event took place on Friday, January 29. That morning, the two doctors and team at Dental Associates provided services to over thirty area children under the age of 18. This is an exciting event that we look forward to with the turn of every new year. 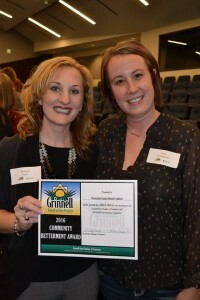 The Grinnell Area Chamber of Commerce held its Annual Celebration, which took place Wednesday, March 16 at Grinnell Mutual’s Bartelt Conference & Education Center. Among the award recipients was the Poweshiek County Dental Coalition, receiving the Community Betterment Award for their efforts in making this event possible, as well as the other outreach activities that they coordinate. The Poweshiek County Dental Coalition is dedicated to improving access to local dental care for underserved children in Poweshiek County. They volunteer their time to do educational programming, outreach, and dental screenings. To celebrate Children’s Dental Health month each January, local dentists and staff at Dental Associates and Family Dentistry volunteer their time to provide free dental exams to children ages 3-18 who are underinsured or non-insured and have an economic need. Congratulations to the Poweshiek County Dental Coalition for all of the hard work these volunteers provide to ensure access to dental care for many area children! 902 Park Street | Grinnell, Iowa 50112 | (641) 236-6174 Email Us! Copyright © 2016 Dental Associates of Grinnell.